Learn about Adobe's tool for coupling together Flash platform-based interfaces with robust Java enterprise servers. ► What Exactly is BlazeDS? Adobe BlazeDS is an open source software that facilitates effective integration of Flex and Java. It enables remote procedure calls and message exchanges between the two platforms thereby helping couple together rich and engaging Flash platform based interfaces and robust enterprise servers. Being open source, BlazeDS is freely available and can be downloaded from http://opensource.adobe.com/wiki/display/blazeds/BlazeDS/. This Refcard provides a quick overview of BlazeDS. It attempts to illustrate some of the most important features of the software and therefore acts as a starting point for developers who are interested in the subject. More details, with exhaustive sets of examples, are available in the book Professional BlazeDS (Wiley/Wrox, 2009). Although it's mentioned upfront that BlazeDS helps connect Flash platform applications to Java, it's important to define it a bit further. Therefore both its behavioral and structural aspects are tersely listed in this section. Invocation of remote Java methods from a Flex application. Translation of Java objects returned from a server, in response to the remote method call, to corresponding AS3 objects. Translation of AS3 objects sent by a Flex application to corresponding Java objects for passing them in as method call arguments. Communication between a Flash Player instance and a Java server over a TCP/IP-based application-level binary protocol. Near real-time message passing between a Flex application and a Java server. Management of the communication channels between Flex and Java. Management of connection types between Flex and Java. Pushing data from the server to the client on the server's initiative and not as a response to a request. Java web application that leverages the Java Servlets specification. Web application that runs within a Java Servlet container or a Java application server, for example Apache Tomcat, JBoss AS, IBM Websphere or BEA (now Oracle) Weblogic. Set of services that can be managed using JMX agents. Remoting and messaging program that can be extended by using its Java API. Program that intercepts all communication between a Flash Player and a Java server. With the definition of BlazeDS firmly in place, it's worthwhile to explore Flex client and Java server integration in the larger context of combining the two platforms. Look at the next two figures for some insight into the context. 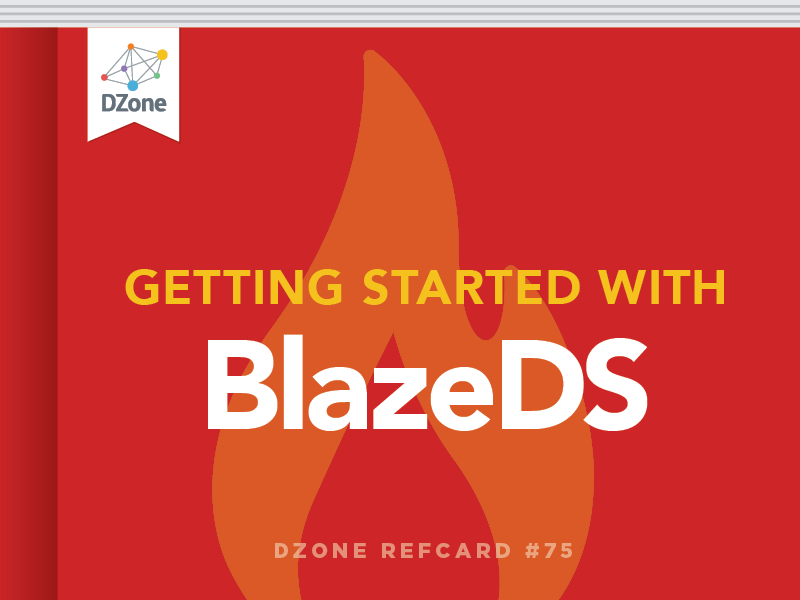 Installing BlazeDS is as simple or as complex as deploying a web application in a Java servlet container. BlazeDS works seamlessly in most mainstream open source and commercial Java servlet containers, including JBoss, Jetty, Tomcat, Oracle Weblogic and IBM Websphere. You can get both compiled and source versions of the software. In addition, one of the binary versions comes in the form of a turnkey distribution that includes a configured copy of the Apache Tomcat Servlet container within the bundle. For beginners, it's convenient, appropriate and advisable to get the latest release version of the binary turnkey distribution. Simply put, at the heart of BlazeDS is a Servlet that bootstraps the infrastructure that intercepts all calls between a Flex client and the BlazeDS instance. This Servlet, called MessageBrokerServlet, uses artifacts like channels, endpoints, and adapters to enable proxy, remoting, and messaging services. A default configuration file, called services-config. xml, which lies in the WEB-INF/flex folder of the BlazeDS installation, defines these artifacts and their relationships in the context of the MessageBrokerServlet. Channels and endpoints connect a Flex client to a BlazeDS server. They are the primary components that enable communication between these two entities. Endpoints reside at the BlazeDS end. Flex clients use channels to connect to these endpoints. The BlazeDS endpoints are Servlet-based endpoints. Each endpoint defines a type and format of communication. For example, endpoints exist for simple AMF data exchange, polling AMF, and AMF data streaming. Analogously, the Flex client defines a set of channels that vary depending on the type and format of communication. For example, the HTTPChannel facilitates communication over non-binary AMF format, AMFX (AMF in XML), and the AMFChannel enables standard binary AMF-based communication. Matching endpoints and channels are paired, and that's when a Flex client and BlazeDS server talk to each other. The binding of channels and endpoints to their implementation classes and their pairing is done in the services-config.xml configuration file. In addition to the endpoints, BlazeDS includes adapters that provide the critical compatibility between the core BlazeDS Servlet that talks to Flex and a server-side resource such as a JMS resource, a persistent data store, or an Object-Relational mapping layer. Adapters are also configured in services-config. xml. The configuration file services-config.xml, in BlazeDS, is logically split into four configuration files. Explaining every bit of the configuration is beyond the scope of this Refcard and is therefore not included. Only a couple of quick examples are shown to give you a flavor the typical configuration elements. Detailed explanations are available in the book entitled Professional BlazeDS (Wiley/Wrox, 2009), which I spoke about earlier. With these brief configuration examples in place, let's explore BlazeDS's pull-based (or request-response based) communication abilities. The following sections include a few more in context configuration illustrations. Using BlazeDS's demoting you are enabled with automatic translation between the Java and ActionScript3(AS3) data types, marshaling, un-marshalling, serialization and deserialization across the endpoints and channels. BlazeDS's demoting capabilities provide fast and efficient data transmission between a Flex client and a Java server with the help of the binary Action Message Format (AMF) protocol and the built-in endpoints, channels and adapters to support it. Adapters make it possible to hook-up specific server side entities. The JavaAdapter included in the configuration example, is a built-in adapter for plain Java objects, which are also sometimes referred to as POJOs. For accessing managed entities like Spring Beans or Enterprise Java Beans (EJBs), you can use the JavaAdapter as the translator but you also need a custom factory to help you access these objects, as managed objects reside in a namespace separate from the one that BlazeDS uses to instantiate its own objects. Data pushing in a web application context implies the server sending data to a browser-based client without the client necessarily requesting it. Long polling can provide near real-time data push by waiting till the response from the server is ready to be dispatched. It's not scalable though, as it blocks connections. Direct connectivity over Real Time Messaging Protocol (RTMP) provides a better scalable connectivity over long polling but RTMP is not available with BlazeDS yet! The RTMP specification was proprietary until the beginning of this year and has most recently been opened up to public. Its inclusion into future versions of BlazeDS is anticipated. Usage of Java NIO provides for scalable connections as blocking connections are replaced by non-blocking asynchronous counterparts. BlazeDS does not include Java NIO implementations for its communication channels but it's not very difficult to include one. The open source dsadapters project (http://code.google.com/p/dsadapters/) aims to provide extensions to BlazeDS that include java NIO based channels, specialized factories, filters and advanced adapters, a lot of which will be available in the near future. Messaging systems involve two typical messaging domains: point-to-point and publish-subscribe. BlazeDS can logically support both messaging domains. It has first-class support for publish-subscribe messaging domain. The JMSAdapter connects with JMS server side messaging systems. The ActionScriptAdapter helps route messages between Flex clients via the server. Therefore JMSAdapter comes handy when Flex clients are wired up to send and receive messages to and from enterprise systems that use JMS, whereas ActionScriptAdapter is useful for building systems like chat applications to help communicate between two Flex clients. The client sends a recurring request to the server at a predefined frequency. Polling is very resource and network intensive. The channel issues polls to the server to fetch data but if no data is available it waits until data arrives for the client or the configured server wait interval elapses. For high frequency updates this configuration has the overhead of a poll roundtrip for every pushed message and therefore messages can be queued between polls. The Servlet API, prior to its current version 3, utilizes blocking I/O in which case long polling soon exhausts connections as multiple concurrent clients utilize the channel. This channel opens an HTTP connection between the server and client, over which the server sends an unending response of messages. This channel avoids the overhead of polling and keeps the connection open for the entire scope of communication between the client and the server. Like AMFChannel with long polling, the constraints of blocking Servlet I/O can exhaust connections as multiple concurrent clients utilize the channel. Object Relational Mapping (ORM) and persistence frameworks like JPA and Hibernate facilitate effective handling of relational data sources with Java applications. Extending the scope of these frameworks to include interactions with Flex clients allows seamless persistence management. Off-the-shelf BlazeDS has no special features to support JPA and Hibernate. However a number of open source projects provide adapters to combine JPA and Hibernate with Flex. Gilead (http://noon.gilead.free.fr/gilead/) and dphibernate (http://code.google.com/p/dphibernate/) are two such open source adapters. The dsadapters project (http://code.google.com/p/dsadapters/) is also in the process of releasing a robust open source JPA/Hibernate adapter. BlazeDS is capable of serializing and transforming Java-based objects to their AS3 counterparts so that may make you wonder why wiring up JPA and Hibernate entities and their collections needs any special handling. The reason for this special need arises because of the way BlazeDS serializes data across the wire. BlazeDS has a set of endpoints where a Flex application channel sends requests up to BlazeDS that resides within a Servlet container or an application server. Responses from BlazeDS follow the route back up from the endpoint to the channel. On endpoints that support translation and serialization between AS3 and Java (or even web services), a serialization filter is defined to intercept calls to the endpoint. When an incoming or outgoing message hits the filter, serialization and deserialization occur. During serialization, the serializer eagerly fetches all the JPA and Hibernate persistent objects and sends them across the wire. The JPA and Hibernate proxies are replaced with the data that they stand in place of. This breaks the lazy loading semantics, rendering the idea of proxies useless. Therefore, any Hibernate adapter needs to preserve the proxy characteristics while keeping the standard behavior of the essential serialization and deserialization mechanism between Flex and Java intact. A common design pattern used to solve this problem is what I like to call the "Clone and Merge Transfer Pattern." The Spring BlazeDS integration project, also called Spring Flex, is a joint effort between SpringSource and Adobe to create a version of BlazeDS that works seamlessly with the Spring Framework. Prior to the existence of this project developers relied on custom factories to integrate Spring and BlazeDS. BlazeDS is a Java Servlet based web application, so it integrates and works with the Spring framework facility that addresses the web layer. The core Spring framework web layer implements an MVC framework and is called Spring MVC. Spring BlazeDS integrates smoothly with Spring MVC. In Spring MVC, all incoming requests are handled by a Front controller Servlet, called the DispatcherServlet. This means you must have a way that all requests coming from the Flex client and intended to be handled by the BlazeDS instance are routed by the DispatcherServlet to the MessageBroker. This is exactly what the Spring BlazeDS project implements. In addition, the Spring BlazeDS project also defines an XML Schema and associated infrastructure so that BlazeDS artifacts can be configured within Spring configuration files as Spring managed objects. With the help of this project it becomes easy to configure Spring Beans as server side remoting counterparts of Flex clients. There is plenty more, including use of annotations, possible for configuring Spring Beans as remoting destinations and you may want to learn more online from the Spring BlazeDS project site mentioned earlier in this paragraph. BlazeDS exposes a public Java API. You can leverage that API to customize the behavior of BlazeDS resources. The flex.messaging.services.ServiceAdapter abstract class sits at the root of the hierarchy. All built-in adapter classes inherit from the ServiceAdapter abstract class. Abstract classes not only define a contract like interfaces do but also define behavior through partial method implementations. The ServiceAdapter class states the base behavioral characteristics of a BlazeDS adapter. You can create custom BlazeDS adapters by extending either the ServiceAdapter or one of its subclasses like the JavaAdapter or the MessagingAdapter classes. Clustered instances of BlazeDS share data and messages across instances. Therefore, message producers connected to a clustered server instance can send messages to message consumers connected to a different server within the same cluster. Besides sharing state information and routing information through the clustered servers, clustering provides for channel failover support. Clustered of BlazeDS instances is powered by JGroups. BlazeDS is a Java Servlets based web application. As data from a BlazeDS server leaves for the Flex client, it can be intercepted using the familiar Java Servlet filter mechanism. Servlet filters can intercept requests to and responses from a Java Servlet. In order to zip the data transferred from the server to the client, a filter can be created to manipulate and compress the outgoing response. Non-blocking channels allow for greater number of connections to be served provided they are not all active at the same time always. Life Cycle Data Services uses NIO channels for connection scalability. You can include the same robustness in BlazeDS as well. If the accessed data is not changing during the course of its reuse it always makes sense to cache it. Caching is a timetested way of increasing performance by avoiding data fetches across the network and using pre-fetched local data instead. Many of these external systems and libraries, such as messaging infrastructure, database connections and stateless business services, lend themselves to pooling. When resources are pooled, they are shared over multiple clients. BlazeDS has acces to all resource pooling strategies that any Java EE web application running in an application server has. Distributing work optimally between a client and its server is an important challenge when architecting RIA. BlazeDS remoting services optimally combine a Flex client and a Java server and allow a developer to distribute workload across the wire in ways without necessarily imposing the overheads that loose coupling like XML based interactions over HTTP and web services do. With no upfront costs and a great set of features BlazeDS is a compelling piece of software for most serious Rich Internet Application (RIA) stacks that involve Flex and Java. A common design pattern used to solve this problem is what I like to call the \"Clone and Merge Transfer Pattern.\"